PHILADELPHIA — Ice can be the colour of a cloudy sky or a glittering diamond. But crystal-clear cubes don’t just look prettier. They melt more slowly — and they even taste better. To bartenders and beverage managers at some Philadelphia cocktail bars, ice is one of the most important ingredients, a crucial tool for bringing a spirit, mixed drink or mocktail to the right temperature. The thought of making a drink with cubes from a regular freezer tray is almost cringeworthy. “Well-made ice and ice that comes from, say, a hotel machine, is like the difference between cooking a meal using a cast-iron pan or a microwave,” says Canyon Shayer, bar manager at Philadelphia Distilling. At R&D cocktail bar in Fishtown, the ice takes as much prep work as the syrups and other ingredients — maybe more, says part-owner Aaron Deary. That’s because all drinks are made with glasslike cubes that were moulded and cracked by hand from large slabs into smaller pieces. When Deary and others developed the bar’s first cocktail menu in the fall, Deary pushed for the emphasis on ice, even though he knew it meant customers would have to wait a few minutes more for each drink. Experts say the key to clear ice is freezing it slowly from the top down, which forces impurities to settle at the bottom and leaves the rest transparent. Known to some as the “lake method,” the process also eliminates air bubbles, which can cause ice to melt faster and thus dilute a drink. Many bars make cubes from machines designed to produce clear ice, but R&D and Philadelphia Distilling have taken the obsession to the next level by buying frozen blocks from Frank’s Ice, a Runnemede company that supplies ice carvings for company parties and events such as weddings. Frank’s, which grew out of a family ice-delivery business founded more than 50 years ago, uses an ice maker that freezes water in a bathtub-like trough, with a pump that keeps the water circulating. Instead of top-down, Frank’s freezes from the bottom up, meaning impurities rise to the surface to be skimmed off before carving. Those slabs are broken into manageable chunks, and later, at Philadelphia Distilling and R&D, into even smaller pieces. At R&D, the bar’s initials are melted in using a metal stamp that brands each cube. Some cocktail bars use one type of ice when mixing and chilling drinks, and another to garnish drinks when they’re served. At R&D, drinks are mixed using ice made from filtered water that is frozen in rectangular tubs, then cut with saws. Staff discard cloudy pieces, keeping only the clear. Many customers of the Chinatown cocktail bar Hop Sing Laundromat never see any of the hundred of pounds of ice the bar goes through each week, because most is used only for mixing drinks before straining them into glasses, owner Le said. 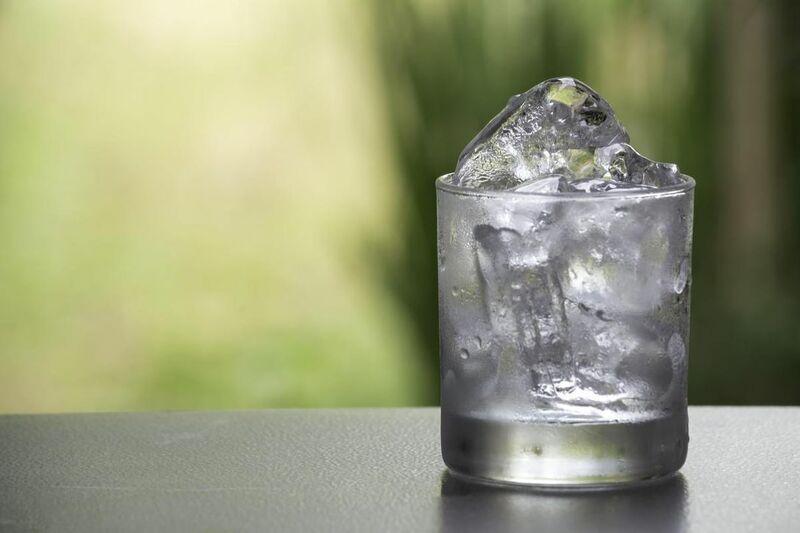 For drinks served with ice, the staff makes separate large and column-shaped cubes from filtered water, storing them in a freezer that holds only ice so as to preserve the taste. Hop Sing’s Le is an evangelist for clean ice; he said his staff is there after closing every Saturday night until almost dawn, cleaning the insides of his Hoshizaki ice maker with toothbrushes until it’s spotless, then running water through it. Le’s machine makes ice by pouring double-filtered water into a tray with a metal mould, then freezing from the top, draining excess water from below. About half an hour later, a tray of fresh ice falls into the machine’s storage area in translucent one-inch cubes. To make clear ice at home, Shayer said you don’t need fancy water, and you don’t need to boil it, though boiling helps. What it really takes is a small insulated cooler filled with water and frozen, uncovered, until it becomes a solid block. Then it can be thawed on a counter or in a sink until the ice block pops out easily. Shayer suggested scoring the surface with lines using a serrated knife, which will create tiny fractures that feather out across the ice, then hacking it into pieces that should crack off easily. A large cube in a rocks glass will keep a drink the same temperature until it’s finished, Shayer said. A large cube will also make some shaken drinks taste better. A gimlet with gin, lime juice, and simple syrup takes on almost a whipped, meringue-like texture when shaken with a large piece of ice. When poured into a glass, a layer of tiny, effervescent bubbles forms on the surface — a touch that the drink wouldn’t get from regular ice cubes. Deary said shaking or stirring a drink with regular-size ice cubes can also give it a watered-down flavour. A drink stirred with the right ice, meanwhile, should taste silky and soft, no air in the liquid, just the ingredients. Asked whether customers can tell the difference, Deary recalled a recent Friday when his saw broke right before opening. Deary, who prides himself on serving old-fashioneds with a cube that is practically invisible, was forced to bring in precut ice.